Tyler Daigle is a veteran Pine Tree camper from Rumford. 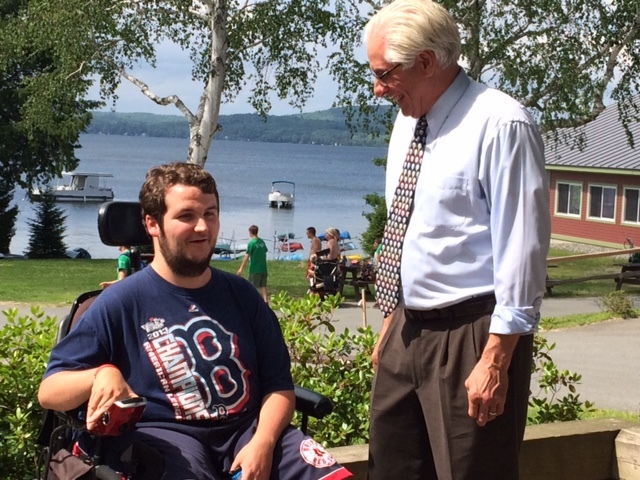 Until he came to camp when he was in second grade, he didn’t know anyone else in a wheelchair. Thirteen years later at age 22, Tyler still attends camp each summer. Fishing, taking the pontoon boat across the lake for an ice cream, or riding a motorcycle are all experiences Tyler has particularly enjoyed. It’s campers like Tyler who inspired Franklin Savings Bank to become a Pine Tree Camp 100 sponsor. “I’m so pleased that we are able to make it possible for a local young person to enjoy the camper experience at Pine Tree Camp,” said the bank’s CEO Peter Judkins. Since opening in 1945, Pine Tree has welcomed all campers regardless of their ability to pay tuition. No camper has ever been turned away. Franklin Savings Bank’s contribution keeps the camp’s open door policy firmly in place.